It's our annual WORM RACE CONTEST! Join us for some fast slow-paced worm racing for kids! Each child picks a worm (that we provide), then they race two at a time. The winners go to the back of the line for the next round. Racing continues until only two racers are left and then those two race one last time to establish the 2019 GRAND CHAMPION. The winner receives a one-of-a-kind TROPHY and a bag of gummy worms. Runner-up receives a bag of gummy worms. 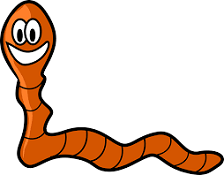 EVERYONE can eat "Worms & Dirt" while they are waiting to race or while they're cheering on the other contestants. Sometimes the event goes fast, sometimes it goes slow. It depends on the moods of the worms. It's ALWAYS a loud, fun time. Remember, not everyone will win, but everyone can have dessert. Please sign up by Wednesday, April 17, so we know how many worms to dig up. Call 764-8102 or stop by the library. Hope to see you at the races!